Polish Environment Minister Jan Szyszko announced at Sunday’s (3 December) meeting in Białowieża that he would appear before the EU Court of Justice on the main trial over the Białowieża Forest. EURACTIV Poland reports. Szyszko also predicted victory in the trial pending before the CJEU, launched by the European Commission against Poland concerning the logging carried out in the Białowieża Forest in Natura 2000 areas. On the same day, the minister invited the participants of an international scientific conference concerning the spruce bark beetle to the Białowieża Forest. The meeting of scientists from Poland, the Czech Republic, Germany and Slovakia – organised by the Ministry of the Environment and the Polish Academy of Sciences – is held in Warsaw today. “For now, we have a dispute over Natura 2000 (…) and we have to win that. If we do not win this dispute, it will indeed be very bad for the natural resources of the Białowieża Forest,” minister Szyszko said during the Sunday press conference in Białowieża. He announced that he will appear at the first meeting of the EU Court on 12 December to settle the dispute that has been raging for many months between the Commission and Poland over illegal logging in the Polish forest. “Poland is one hundred percent executing EU law on matters related to Natura 2000,” Szyszko repeated. “I hope that this will be the last hearing, and this result – in my opinion – should be clear, if there is justice, and if the judges approach this with objectivity, the truth decides,” the head of the environment department said. Szyszko stated that he did not accept “the possibility that the EU would not respect its own law” and announced that if the EU does not agree with him, it would be tantamount to the “non-respect of the truth” by the EU. Szyszko insisted not only on his concept of protection of the Białowieża Forest, but also on his own interpretation of European Union law. 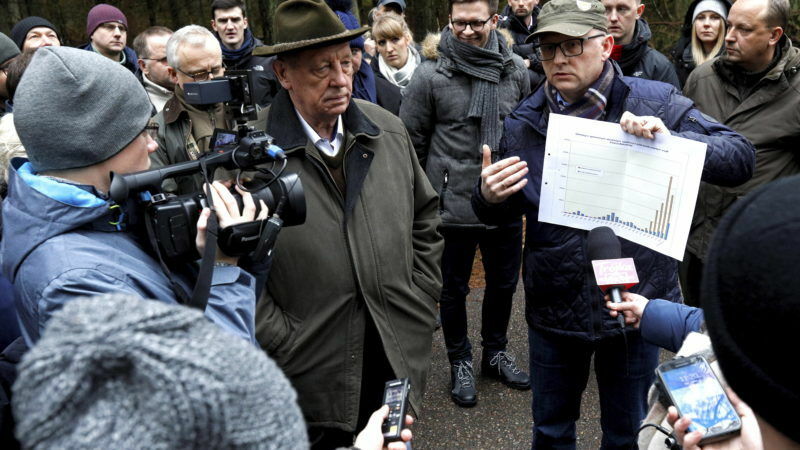 “We defend EU law,” he argued in front of the scientists during Sunday’s tour of the Białowieża Forest. He also tried to prove that this is not a primeval forest, but has been subject to human activity for centuries. The ministry also presents the protection policy of the Białowieża Forest on its website. For non-compliance with the Court’s interim protective measure – ordering the cessation of logging outside the strictly defined places threatening public security – threatens Poland with at least €100,000 per day. Meanwhile, ecological organisations claim that despite the ruling of the CJEU, logging is still being carried out in the forest.